After some time connecting both machines by FTP I'm tried to share folders between them but I didn't find the way. It seems that the main problem is that Snow Leopard uses SMBv1 and Windows 10 Home SMBv2. I tried to find SMBv2 for Snow Leopard but was not possible. Is there any way to share folders between these two SOs? Hi and welcome from Barcelona, one of our most favourite cities. I don’t think it is possible given the huge gap between Snow Leopard, eight versions behind the current operating system for Mac, Mojave, and Windows 10 which is their latest version. Access the macOS system or folders from winOS, or do you want to access winOS system or folders, from macOS, or both? How did you originally set it up? Try these suggestions. This should be possible even with Snow Leopard. I can't test it at the moment though because the monitor on my Win 10 box is down for the count at the moment. When you enter the password to the Windows account I don't remember whether or not it has to be preceded with a $. If these directions don't work let us know. I may be able to test this shortly. It should work. 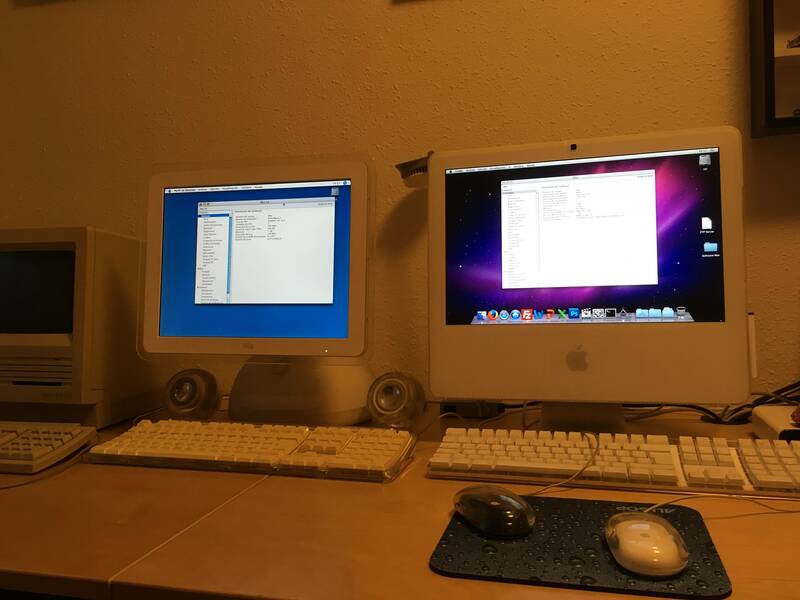 I have an older iMac here with Mountain Lion on it which is a bit newer OS but still old and my Wimdows 10 boxes pick it right up. I can from Finder transfer files to Win 10 and from Windows to the Mac also. @Papalapa Give these directions a look. It describes how to turn on SMB support on the Mac side. As the Article indicates, the process is essentially the same in Snow Leopard and forward. Yes. Slydude is correct. SMB has to be enabled for Windows Network Shares. I should have mentioned that earlier. I thought SMB sharing was off by default in OS X but I wasn't sure till I did a little more digging. I want to aceess the macOS shared folder (just one folder will be enough) in order to copy files from Win10 to macOS. What I actually do is to start the FPT server on macOS and connnect from Win10, but to activate FTP on macOS I need to send a command using the console because Snow Leopard has not the same way than Tiger for example, where only clicking "FTP" in Shared options activates or deactivates the FTP service. Many thanks but I already done these steps before. If I try to connect from Win10 to Snow Leopard I get the message on Win10: "It is not possible to connect to the shared resource because is not safe. This shared resource needs the obsolete SMB1 protocol. Win10 requires SMB2 or higher. If I try to connect from Snow Leopard to Win10 I get the message on macOS : "Connection error. An error has occurred when connecting to the server 192.168.1.199. Check the server's name and IP and try again". So, that's why I asked if there's any way to install SMB2 protocol on Snow Leopard. Thank you, of course it was. Thank you Slydude but the problem is the same, when I try to connect I get the message on macOS : "Connection error. An error has occurred when connecting to the server 192.168.1.199. Check the server's name and IP and try again". Just as an FYI, Snow Leopard will not run on PPC (G5) tech, it is intel only. Thanks for the clarification. I thought you were having more general issues connecting from Snow Leopard to Windows 10. I've done a little more digging and so far I haven't had much luk finding good info about SMB 2 and Snow Leopard. Much of what I have been seeing is an ongoing argument regarding Apple's support for SMB 2 support. As you can see in the picture, to the left there's the G4 and to the right the G5 ¿? It is true that in the "About this Mac" right one shows iMac 4,2 model while the left one shows PowerMac 4,2. Then I have two G4 ¿?¿? If the "About This Mac" info is showing a model identifier number of iMac 4,2 it's not a G5. It is indeed an Intel based Mac. It is relatively early in the changeover to Intel but it is not a G5. Connecting Snow Leopard to a domain? Connecting my home mac to my mac at work which is on a windows network?